Welcome to my Irish Author blog, Sinead! Just to let our readers know, you and I first met at last year’s Dublin, Ohio Irish Festival, where we both had an author table. It was a great weekend, filled with lots of craic! S: Last year’s Dublin Ohio Irish Festival was the best I’ve been to so far, largely due to yourself and some of the other authors there. If people realized how much fun we all have in the Author Tent, they’d be flocking to us in droves! Can you tell us about the books you had there? I have four books out: two novels, Walking Through The Mist and its sequel, Crossing The Lough Between, which are both set in present day Ireland/Northern Ireland and portray the lives of a group of young musicians and the challenges, crises, and celebrations they experience, and two poetry collections, Fragility and A Song Of Ireland. All four books did well, and attracted a variety of readers. I have been reading your books over the past while and what really stood out was your incredible understanding and I would say love, for Ireland which shines through in your writing. Indeed, I would agree totally with the statement on the back cover of; “A Song Of Ireland,” that the land has captivated your heart. How did someone who hails from New York, come to write with such passion for Ireland? S: I think a large part of it is down to genetics. Ireland is in my blood. However, I didn’t grow up exposed to the Irish culture. Once I did finally connect with my Irish roots I fairly well immersed myself in its music, movies, food, books and history. Here in Buffalo, New York, we are very fortunate to have a strong Irish community, and the Buffalo Irish Center which is a gathering point for many Irish culture related classes and events. The more I experience all things Irish, the deeper my heart is attached to this lovely land and its people. Can you fill us in on this poem…what inspired you to write it, was it “spur of the moment,” or had you studied the Easter week rebellion? S: Dublin Shadows is one of my favorites as well. I’m so glad you like it. Ireland, as you know, has many “thin places”, places where the separation between this world and the spirit world is so thin you experience a connection with those on the other side. The first time I went to Ireland, in 2012, I had a few “thin places” experiences. One was in Dublin, where every place I went I was reminded of those very brave 1916 Rising souls. Kilmainham itself was a very deeply moving experience. My friend and I didn’t even get to go on the Kilmainham tour proper, but did get to walk through the museum, which itself is very sad and powerful. Walking past the courtyard, imagining the 1916 Rising leaders being executed there, I did cry a bit. Walking past the GPO, the General Post Office, where the Proclamation was first read, stirred my soul. In fact, at the Long Library at Trinity College, surrounded by some of the world’s greatest volumes, the thing that moved me most was the original of the Proclamation in its glass case. I cried a good deal reading that, understanding the struggle for freedom and for regaining their cultural identity that the Rising leaders sought – because, remember, for some of the leaders it started with wanting their language, their music, their identity back – reading those words was very, very powerful. And wherever I went in Dublin, I could just feel those people touching me, whispering in my ear, invading my heart. When I returned in 2016, after having read more of the history of the Easter Rising/Rebellion, I could imagine all that much more as I walked the city’s streets, and that’s when I wrote the poem. S: I would love to see that happen! How do we arrange that? I think it’s like the old question; “How do you get to Carnegie Hall?” A: Practice! So Sinead, tell us how you came to start writing – who were your influences? What has the future in store for Sinead Tyrone? S: After I win the lottery and move to Ireland? (In my dreams, anyway!) I’m currently working on my third novel, the final book in the Macready’s Bridge series, and am planning the next series and the one beyond that. I like writing both fiction and poetry, so I am also starting to gather material for a new collection of poems, which so far may be about the immigrant experience, both from the Irish point of view historically and from more current cultural reference points. Please talk about anything else you want…your future writing….songs you are interested in …travels..etc. Hardly nobody makes use of this “freelance part”! S: I love doing creative things. Photography is my next biggest passion after writing; when I have my camera in hand there’s a part of me that comes alive. Where I live in Western New York I have an endless supply of photographic subjects – Niagara Falls is very close by, and downtown Buffalo is full of amazing architecture as well as our beautiful waterfront. I would someday like to try kayaking, although I’m sure that will be a great exercise in humility – if you want a good laugh, I’ll see if I can get someone to videotape my first outing, as I’m sure it will not go perfectly smooth! It’s been about a year since my last trip to Ireland, and the past week I have found she is haunting my thoughts and dreams again. There are so many places to visit in Ireland and Northern Ireland. I’ve never been to the southwest corner, the Ring of Kerry, etc., and I don’t know if I’ll ever make it there. My heart seems to pull me North. No wonder, since that’s where the ancestors are from. And Donegal and Connemara are such gorgeous regions, I long to be in those places again. I have found that the more I learn of Ireland’s history and places, the more hungry I am to touch, see, smell, and know the country and its people. In two trips to Ireland I’ve taken about 17,000 photos. Some of them are even good!! I’ve learned over the past decade that following one’s passions in life is so important. Find what makes you “come alive”, and pursue it. Challenge yourself to overcome fears. When I crossed the Carrick-a-Rede rope bridge in Antrim, I was scared. I’m afraid of heights and here I am on this bridge that could drop me onto a stack of jagged rocks! But when I reached the other side, I felt I could take on the world! Go for that feeling in life. Where can readers find your books? Where are you doing signings this year, for example? S: My books are all available at amazon.com, in paperback and in Kindle format. They are also available at nfbpublishing.com, at Dog Ears Bookstore in South Buffalo, as well as a number of bookstores which are listed on my website. 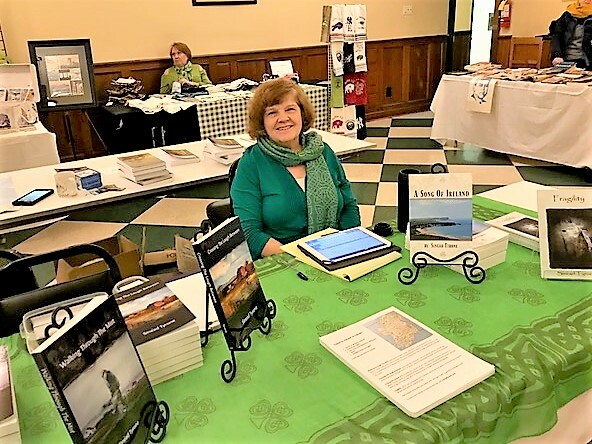 I will be signing books at the Dublin, Ohio Irish Festival August 3-5, 2018, the Milwaukee Irish Festival August 17-19, 2018 and the Buffalo Irish Festival August 24 – 26, 2018. S: J.P., thanks very much for the interview. It was an honor to meet you this summer. 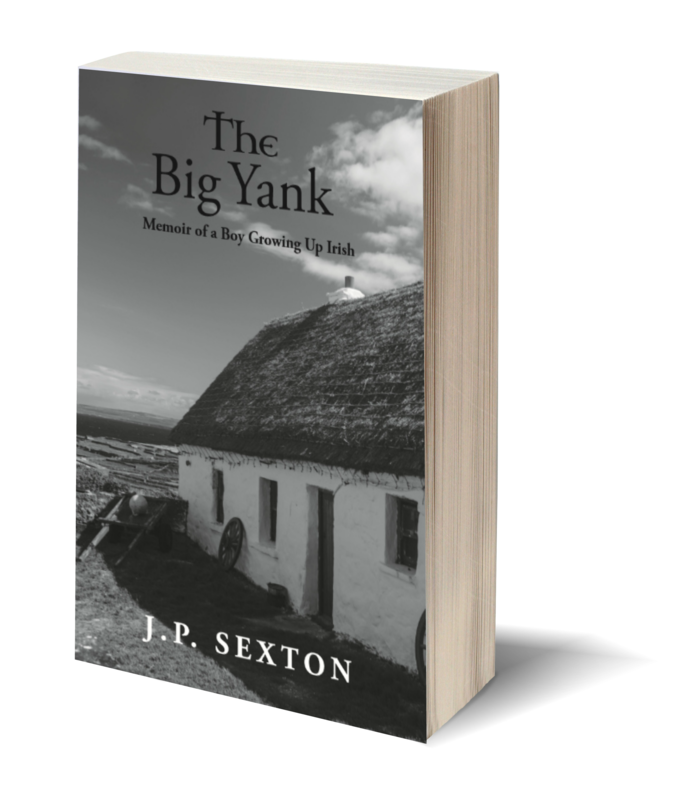 I have finished reading your book The Big Yank and found it riveting, both in the story you told and in the way you told it. I look forward to seeing more of your works. I also look forward to seeing you at future events. In the meantime, keep writing, and I wish you the best of luck in your endeavors. And I can’t wait to read more, as I know there will be more. On behalf of readers everywhere; never get tired of being inspired! I love Sinead’s writing. Whether the novels or the poetry, she takes her readers on a magical trip and her characters come alive right in front of your eyes! I’m eagerly awaiting her next novel, poetry book and anything else that comes from the talented mind of Sinead Tyrone! Fabulous interview! I loved The Outsiders too and taught it to 9th graders for a few years. Great for discussion. Your love for Ireland echoes how I’ve felt every time I’ve been there! What a great interview. And in your own humble and inquisitive way, you managed to interview him as well. I hope you make it to Ireland again soon. “Dream no small dreams”..to quote a writer friend of mine.